I used to have a column in parenting website, Juana.com.ph. The website folded within a year and that made me very sad because I loved being a parenting columnist. Loyal Readers would know one of my dreams is to be a columnist. Well, it came true naman. I was a lifestyle columnist at Manila Bulletin 4 years ago (my column was called Behind the Scenes) but that didn't go so well because I was a new mom for the third time and quickly found I couldn't juggle three kids, a blog, and a weekly newspaper column. After a year, I resigned with much regret and I think my editor was very disappointed I wasted my chance. So, two years later, when the Juana column offer came, I was so happy! Oh well. Life in the time of rapidly changing media. Anyway, I wanted to publish my Juana articles here on my blog to preserve them. I'll post two or so every month. This was my first—a love letter to Vince when we were so dangerously close to not making it. 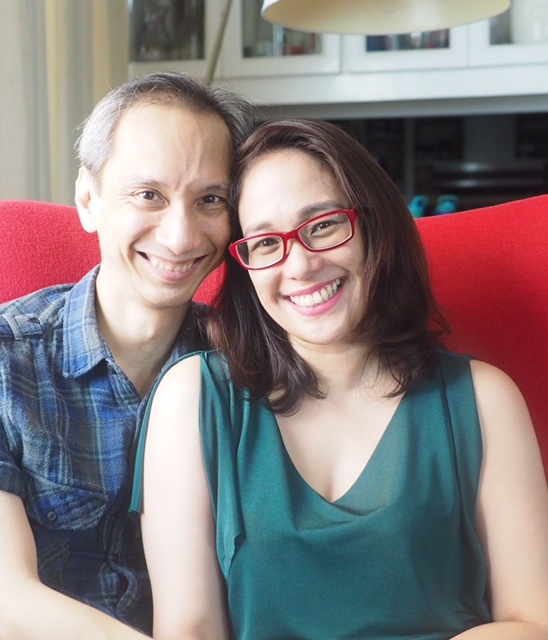 It's apt since this April is also our 19th fell-in-love and 11th wedding anniversary! I'll add an update after. This was taken shortly before I wrote my letter. People tell me all the time how lucky we are to have careers that allow us to work from home. I blog. You write. I cook. You play with our boys. I negotiate another contract. You edit another chapter of your book. I help the preschoolers with their homework. You read to the toddler. I rush to meet a client’s deadline. You rush to meet a magazine’s deadline. We live and breathe words and kids under the same roof, 24/7. It’s an amazing life, one we always dreamed of, and we made this life together, just the two of us. People tell me how lucky we are that we live the way we do, but they don’t see that we are so busy, we sometimes spend days rushing past each other. There’s always dishes to wash, laundry to do, deadlines to meet, emails to answer, chores, errands, kids! Always the kids. They need to be fed, hugged, kissed, read to, played with, bathed, scolded, encouraged, taught, brought to school, fetched from school, again and again and again. While we love our life, everything in it is so urgent. Everything is now, now, now! Oh, Vince, if you only knew that my need for you is just as urgent as your need for me. I feel it from across the living room, where the kids and their toys and my laptop and notes are between us. It isn’t even sexual, this need, although of course many times it is. Most times what I desperately need is a laugh, a hug, a kiss, a good long chat. I feel it when we’re in the car with the noisy kids in the back seat and the endless errands before us, and we can’t really talk because the things we talk about when we finally do talk are just for the two of us. I miss the two of us. Please know that there will always be the two of us. We just need to ride this out. I hope you’ll wait for me, not years from now when we’re old and wrinkly. Please wait for me now, for those pockets of moments when we can be alone, even for just a minute. I know you do but after six years of the kids, work, and exhaustion grabbing me away from you, I know sometimes you give up and you fold into your books, knowing your books are always there and I am not. Sometimes I also ignore those moments. Sometimes I catch a rare chance when the kids are all asleep, and this is it, this is when I can be with you, but I chose instead to check Facebook because being married takes effort and I was too tired to get up and be married. I’m sorry, Vince. I’m sorry for not always appreciating the gift of you. And oh what a gift! I still remember that rainy Monday from 18 years ago when I met you. I didn’t know then that you, my wonderful you, were about to completely change my miserable life. My luck changed when I met you. People call it luck. I think it was love. It was love that made us push each other to chase our dreams and be each other’s sole cheerleaders because no one else believed we can make a living out of words. It was love that put us in a church on the hottest day of the year to vow forever. It was love that made us children, and love for them that made us build a life around them, and love that keeps us going even when we haven’t talked or bathed or laughed together for days. So it isn’t luck that we have. It’s love. And love may not be as exciting and as passionate when it was just the two of us but the two of us built this amazing life with so much love. We may be buried under diapers and duties now, but we’re still here. And it sure isn’t luck that’s keeping us here. No, it isn’t luck at all. For that, I’m grateful. This is us now. Stronger, better, happier! Update: That letter was published February 2017. My Juana editor said my theme was Valentine's Day. I was a bit dismayed because I wasn't feeling very romantic. I believe any mama drowning in childcare and household chores can relate. But I sat down, took pen and paper, and forced myself to think about Vince, to think about him and only him and, and about us, too, and I was overwhelmed with a fierce love and longing, and then grief because children were overwhelming our marriage. I was afraid we wouldn't make it, not because we were having affairs or fighting or hurting each other, but because we were so focused on the kids. Kids when we wake up, kids throughout the day, and kids when our heads hit the pillow. I was afraid that one day, we'd look up and see a stranger. So I wrote my letter. It's been more than a year and I'm happy to tell you we're still married. And we're so much happier now in our marriage than last year. There are things that could make our life better (like more money, a yaya and a maid, the work we really want to do—like writing and publishing books, editing dying magazines, and did I mention more money haha) but all of those are extra now that the marriage is going smoothly again. What changed? Basically, it's time. I have more time for Vince now. I'm glad we waited for each other and I'm glad we helped each other through it. You know how people will demand, "I'm married. I have to have my needs taken care of!" Valid point. But what if you're sick, what if you're apart, what if you're working, what if you're just too tired and overwhelmed by parenthood? I believe in waiting, I believe in the right moments, I believe in riding it out. And I'm glad we waited out this whole small-children phase in our marriage. We know there will be other phases when we'll have to take a back seat to more urgent things. But we survived this. Good things come to those who wait. I'm glad we were so patient because now our marriage is good. Again. You made me teary eyed Frances. Lyndon and my situation may not be exactly the same as yours and Vince's but I can truly relate with the riding it out. Instead of working at home and round the clock Mommying, ours is battling the daily commute which exhausts the hell out of me and also the lack of us time (going home late, having to attend to Lyndel, chores, work brought home etc) But yes, we should be patient and wait for each other. I like that idea of having small pockets of time. But I admit it's so hard to resist just lounging around and checking FB or reading something else during those moments than connecting with each other. We're getting there, getting there with patience, perseverance and prayers. Thank you for sharing this. As a married, sahm, myself, I felt sad and afraid because we did't talk anymore. At least, not like when we were still dating, when hours would pass by and we talked about anything and everything. I don't know what changed. Maybe it's motherhood. I do hope we could bring back those moments. I sometimes dread old age, afraid that we might become two married individuals getting by, living side by side, but without any connection. I shudder just at the thought. Good things come to those who wait! I am also a believer of this phrase. Patience lang talaga and faith! This letter moved me. Nakarelate ako mumshie. But hey, I only have one child and it feels like I have the whole world on my shoulders. Maybe because even if I have a partner, I don't feel like he's battling the struggles of life with me kasi we are not living under the same roof. We are already on our 6th year together but still, I am kinda confused if our relationship would still work after few more years. I am afraid of marriage because I am afraid of long-term commitments, of submitting myself to him, of sharing decisions with him and also, I have trust issues. You know what momma,I adore you. I adore you for your openmindedness and for your patience, for your beliefs that in the right time, everything will fall into its proper places.